Give your hair a long lasting hold with this Redken Pure Force 20 finishing spray. Its advanced formula delivers a clean, firm finish that will also give hair a strong and shiny look all day. This Redken Pure Force 20 finishing spray is an environmental friendly and non-aerosol spray that dries quickly. The product will make your hair firm without leaving residue after brushing. Spray on your dry or towel dried hair. I'll start off by saying that I am not a great Redken fan. 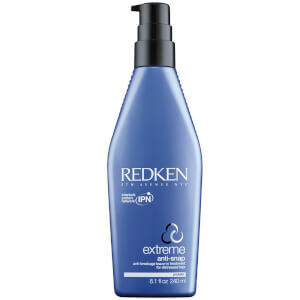 I have tried many, many products by Redken and have been disappointed by almost every one. However, I am very pleased to say that this hairspray is an exception. If, like me, you want a hairspray that gives incredible, long-lasting hold, that won't leave hair crispy, dull or weighed down, then this could be the one for you. I can curl my long, fine but thick hair, spray lightly and the curls will still be there the next day! My hair will stay looking shiny and healthy and hold the style for the whole day and night or until I wash it out . The non-aerosol can dispenses just the right amount of product and lasts so much longer than the conventional aerosol sprays. I thoroughly, thoroughly recommend this product. I am a hard customer to please when it comes to hair care but this would be one of my top picks!